Mars, as seen in the 1970s by NASA's Viking 1 orbiter. If life got a foothold in the Martian subsurface long ago, it could have tapped into a plentiful chemical energy source, a new study suggests. That source was hydrogen, generated when radiation split underground water into its constituent parts. 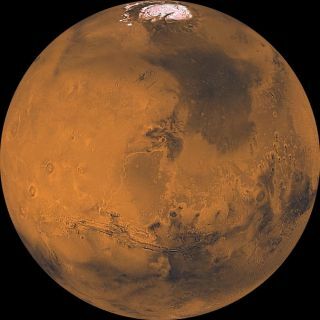 And there was probably enough available hydrogen down there to sustain a sizable community of Mars microbes for hundreds of millions of years, starting about 4 billion years ago, according to the study. Using data gathered by NASA's Mars Odyssey orbiter, Tarnas and his colleagues mapped out abundances of the radioactive elements thorium, potassium and uranium in the Red Planet's crust. Because these elements decay at known rates, the team could extrapolate backward, determining the levels in ancient times. The researchers also analyzed measurements of the Martian crust's density, as well as the results of geothermal and climate models, to determine how much water was likely available to be split by this native radiation when the planet was young. They concluded that the Red Planet probably harbored a global subsurface "habitable zone" several kilometers thick about 4 billion years ago, the same epoch when liquid water was flowing across the Martian surface. Scientists aren't sure what that surface looked like back then — whether it was relatively warm and wet most of them time, or if ancient Mars was a profoundly chilly place where water flowed only transiently, during fleeting warm stretches. A cold ancient Mars would likely make it harder for life to bloom and radiate on the surface, but the same isn't true for hypothetical subterranean organisms. Indeed, overlying ice would actually make the subsurface zone more habitable, by preventing newly split hydrogen from escaping into the atmosphere, study team members said. "People have a conception that a cold early Mars climate is bad for life, but what we show is that there's actually more chemical energy for life underground in a cold climate," Tarnas said. "That's something we think could change people's perception of the relationship between climate and past life on Mars." The new study, which will be published in the Nov. 15 issue of the journal Earth and Planetary Science Letters, could help future missions that aim to search for signs of Red Planet life, such as NASA's 2020 Mars rover. "The mission of the 2020 rover is to look for the signs of past life," Mustard said in the same statement. "Areas where you may have remnants of this underground habitable zone — which may have been the largest habitable zone on the planet — seem like a good place to target."